The Consumer Price Index turned 100 last year. While the CPI was first published in 1921, at that time they made data available going back to 1913. The Bureau of Labor Statistics has measured 100 years of price data through war and peace, boom and bust, lassez-faire and managed economies. 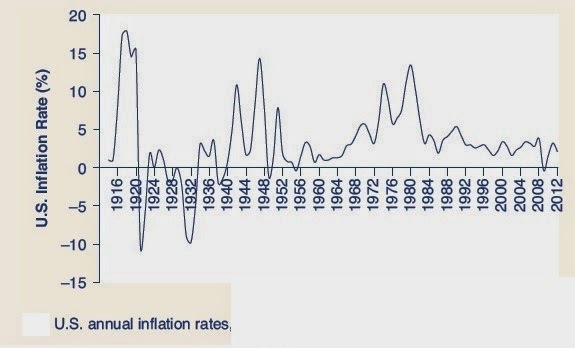 Over the past century there have been three major periods of high inflation: World War I, World War II, and the peacetime inflation of the late-‘70s and early-‘80s. Wartime inflation is fairly easy to understand. Products were sent off to soldiers in the field, leaving less at home for domestic consumption. Lower production with stable demand means higher prices. After each of the wars, prices declined sharply. The peacetime inflation of the ‘70s was confusing. The mechanism of inflation has not been well-understood. In the ‘70s, as imprudent monetary and fiscal policy led to double-digit inflation, the Federal government sought to impose price controls and use moral suasion to keep prices down. Indeed, the policy of allowing most companies to set their prices without government interference is fairly recent. Ironically, it’s only in the last two decades that most people feel inflation has finally come under control. It’s taken a long time to understand that inflation is a result of errors in policy, not of greedy people. The freer our markets have become, the more efficient our prices.